Ben Stiller's having a mid life crisis. He's pushing fifty and not nearly as successful as his pals from college. They stayed in big, exciting cities and Stiller moved to Sacramento to start a non profit. Now his son has a chance to go to Harvard, if the kid can impress the admissions team. But the interview hits a snag, and Ben must call in favors from his far superior friends. "Brad's Status" rolls out in quiet, contemplative moments. Stiller threads the line between sympathetic and irritating. "Brad's Status" also features a star-making turn by Shazi Raja as a with-it student, who dazzles Stiller as she puts him in his place. As with Jimmy Stewart, Stiller's had a wonderful life: He just needs reminding. 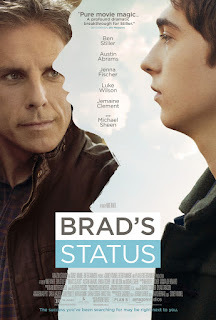 "Brad's Status," rated PG-13, 3 stars. Does it deliver what it promises? Angst made interesting. Is it entertaining? Funny and realistic. Is it worth the price of admission? A delight.